Not gonna lie, I shed a wee tear last night after the madness of 90 Day Fiance season five drew to a close. What are we going to do with our lives until the next crop of morons is rustled up for season six?!? My husband asked me last night during the three-hour marathon if I “sometimes felt like a bad person?” for watching this train wreck. Um….NO. No I do not, sir! TLC has accomplished the impossible, has it not? It has literally made me feel better about every life choice I have ever made, and for that I am forever indebted. As mentioned in the previous recap, I’ll only be covering the one-hour finale in short order, but oh boy – is there lots o’ drama in last night’s Tell All to snark on too! Feel free to do so in the comments section, where all snark is embraced and cherished equally. Now, on to the show. In the interest of getting to the good stuff, let’s run down the highlights of each couples’ final moments with us. We laughed, we cried, we cringed with embarrassment at the bras hanging out of people’s backless shirts. It was a journey, people. I have a million and one holiday tasks to do, but damn if I can tear myself away from the drama of 90 Day Fiance – both on the show and on the internet – for even five consecutive minutes to slap a bow on a present. And really, who needs presents when we’ve got the supreme gift of these psychotic lovebirds in our lives for TWO STRAIGHT NIGHTS? 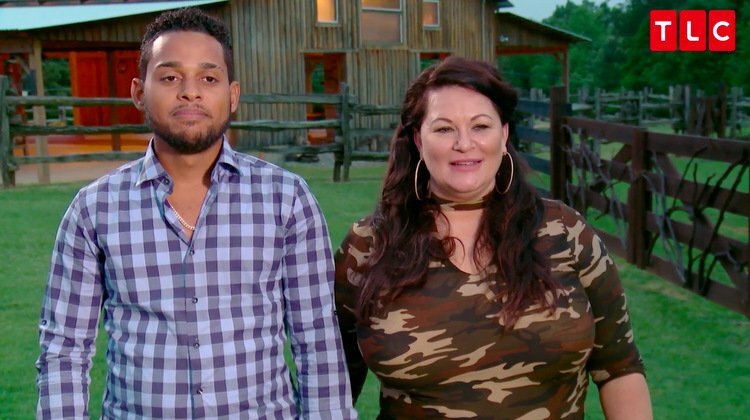 Just to clarify, here’s what TLC is doing to us this week: Sunday night was a regular 2-hour installment of 90DF, followed by tonight’s 1-hour finale, followed immediately by 90 Day Fiance: Couples Tell All! You guys – my heart can hardly take it. I’m gonna need to dress up in one of Kentucky-David’s lady mumus and plant myself on the couch for a nice, long cookie coma after this whole mess is over. In an effort to bring you all of this week’s highlights without having to admit myself into a psych ward, we’ll post a recap tomorrow of tonight’s finale, but not the Tell All. Of course, feel free to snark on ALL of the drama in the comments section in tomorrow’s recap. As we know, there’s no shortage of catastrophic content to discuss! But let’s get through Sunday night’s pile o’ sh*t first. And by that, I mean (in stank order): Molly & Luis, Annie & David, Nicole & Azan, Evelyn & David, Elizabeth & Andrei, and Aika & Josh. Last night, we found out that Thai-David’s kids hate him as much as everyone else does! Annie has a front row seat for the drink throwing, which is served up courtesy of David’s daughter, Ashley. Molly finally calls Luis out on his comments about her kids, but he’s more concerned with her devil-candles. Seriously. Evelyn and David continue to be totally miserable in New Hampshire as they steam-iron the beige underwear they’ll rock on their wedding night. Josh and Aika visit a fertility doctor (snore), and Elizabeth’s sisters try to make Andrei break up with her by stealing her phone at her bachelorette party. These women are not twelve years old, by the way. Molly tries for the hundredth time to turn her houseboy into a husband (and stepfather), but Luis isn’t interested. Elizabeth and Andrei change up their wedding plans to further anger her family, Josh admits to Aika that he’s had a vasectomy, and Evelyn tries to talk about S-E-X with David. Spoiler alert: It does not go well. As in, middle-school-health-class bad. Evelyn also takes a trip to the most depressing underwear store you’ve ever seen in your life, which was of course the MAJOR highlight of my night! O’ Delusion, thy name is 90 Day Fiance! This week, we travel deeper into the rabbit hole of each couples’ fantasy that their Happily Ever After awaits. Except for the fact that Thailand-David is too drunk and broke to keep his bride, Annie, interested long enough to force her on a U.S.-bound plane. Luis is sick of being Molly’s houseboy, and he’s apparently sick of pretending that he is normal. Because he could potentially be the most inappropriate cast member to EVER grace this show (and that’s saying a lot, considering who’s been foisted on us over the years). 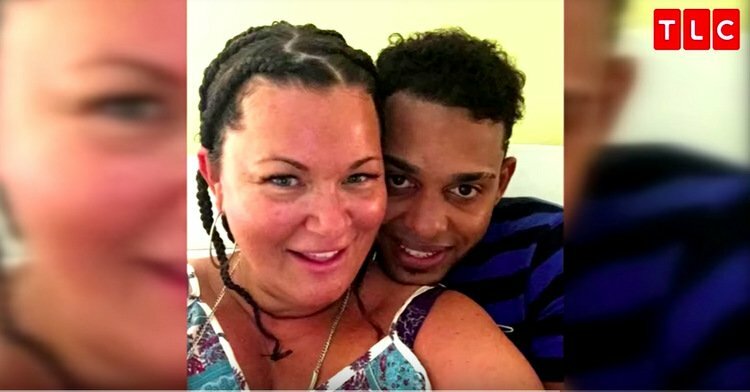 The couples of 90 Day Fiance might not be able to see the enormous red flags whipping around in the tornado of their relationships, but that’s what family is for! At least, that’s what Molly’s family is for. But when her father and Olivia double-team to talk some sense into Luis and her, the 90-day lovebirds naively write off their concerns. In Evelyn and David’s case, it’s not family who interferes – it’s Evelyn’s very wise bestie, Mikayla. Instead of listening to to Mikayla’s rational questions about their rush to the alter, David shows that he’s just as awful as Evelyn when he cruelly insults Mikayla, reducing her to tears. Now I must also revoke my stance on David being kinda cool. It turns out he and Evelyn deserve each other. May their joint obnoxious, immature entitlement long-fester and destroy! Meanwhile, Nicole introduces May to Azan’s family so they can help raise her too and Thailand-David and Annie are propositioned by David’s walking-ATM-friend, Chris – who turns out to be insanely creepy, guys! Aika also arrives on U.S. soil to raise Josh’s self esteem by at least ten bro points, and Elizabeth lands in Ireland to face the Gorgon Andrei. Whew. It was a super-sized two-hour episode last night, so let’s get to it! I hereby revoke my previous stance of rooting for Evelyn. Because, it turns out, she is THE WORST. On this week’s 90 Day Fiance, we find out exactly what happens when an 18-year old girl is told by her family that she is super-duper special and gifted. She becomes an insufferable brat who entraps entices a foreigner into marriage with her innocent smile, then promptly begins making his life a living hell. David is finding this out within 48 hours of landing on American soil. Elsewhere, Nicole and Azan fight over how to parent May while, Thailand-David has to break it to Annie’s parents that he is basically baht-less. In Georgia, Molly has to face facts that her daughter, Olivia, is not at ALL okay with Luis moving in. Lastly, Elizabeth prepares to visit her neanderthal fiance, Andrei, in Ireland. She will, of course, need to also travel back in time (like, pre-women’s rights) in order to meet him. In Morocco, Azan isn’t able to handle a toddler, nor his naked hatred of Nicole, his bride-to-be. When Nicole yells at him on the street about how he (rather than her, the actual parent) should pay better attention to May, Azan is once again embarrassed by her in public. Which he should be used to by now. But it’s been a few months since his last trip of torture, so maybe he’s rusty? Nicole just wants to pull the “I’m May’s mom!” card when it’s convenient, scolding Azan about giving in to her fits too much. HA! This comes from the chick who literally pushes, screams at, and blackmails people every time they don’t give into her pathetic whining. It’s Monday morning, so you know what time it is! Time to grab that cup of coffee and relish in the fact that you are not one of the poor souls featured on 90 Day Fiance. This week, we meet Josh and Aika, who is giving me strong whiffs of Anfisa with her expectations and no-nonsense talk of Josh “providing” for her. Molly’s bartender-fiance, Luis, arrives from the Dominican Republic, much to the chagrin of Molly’s eldest daughter, Olivia. Bonus: Luis wastes no time in calling his bride-to-be “chubby.” He’s a smooth talker, this one.